Home / Balsamic Titbits / What is Balsamic Vinegar? Take a look. What is Balsamic Vinegar? : Today i tell you what is Balsamic Vinegar and more specifically what it is the TRADITIONAL BALSAMIC VINEGAR OF MODENA P.D.O. It is a vinegar-based dressing that’s unique in the world. It comes solely from the province of Modena, where the product ages to perfection thanks to the characteristic climatic conditions. This is the balsamic vinegar you will find on my table! Free from aromatic substances, this condiment is obtained from the slow and progressive acetification of cooked must. During the long ageing process in a set of barrels made of different types of wood, the product acquires its amazing and distinguishing features: the characteristic fragrance, with an evident but pleasantly harmonious acidity; the glossy, richly deep brown colour; the sweet, sharp, well-balanced flavour, savoury, generously full-bodied but with velvety undertones; a density expressed in the proper degree of smoothly-flowing, syrupy consistency. Fragrant and flavoured, this very special condiment brings out the best in the most different, unusual and difficult culinary pairings. By the way, did you know that from a casks-battery (usually 5 to 6 casks per battery, the first and biggest cask starts with 50-60 liter, the last one 15 liter) of Balsamic Vinegar of Modena, we collect ONLY 10% of final product from the last and smallest one -about 1,5 liter- every year? 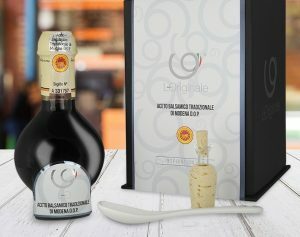 Only the Balsamic Vinegar bottled by the Consortium in the exclusive bottle created by Giugiarò can be renowned with the “Traditional” name on it’s label. A burst of spontaneous joy for the palate, a sublime Italian flavour. Timeless recipes, traditions that repeat themselves to create this precious condiment, unrivalled protagonist of memorable dishes. We have taken particular care in selecting a series of traditional Balsamic vinegar specialities presented in a unique, modern, refined guise that fully expresses our taste for excellence, glamour and luxury. An ongoing selection made by L-Originale with an almost obsessive attention for details, to offer you only the best, day by day.